When showing the price financed in installments, you must indicate the actual price, the total financed price, the number and amount of each installment, the annual effective interest rate applied and the total financial cost. In case you sell products and/or services based on the modality financed in installments, you are not allowed to include the phrase “without interest rate” (or any other similar) when the cost of financing is transferred to the retail price. The TEA and the CFT can be obtained through our API using the installments feature. 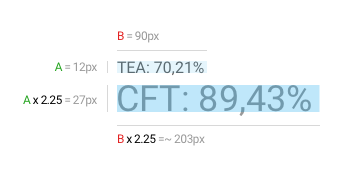 It is worth noting that in case of 1 installment or installments related to promotions with no interest, they will have the values of TEA and CFT equal to 0. Although the value is 0, in scenarios where the customer chooses more than one installment, you must show it in the purchase form anyway. We will use the Mercado Pago library to check the installments feature.